Home A very easy, 300km, four day ride (not including rest days). Dead flat country, friendly locals and not a lot of traffic. Religion: Buddhism, Roman Catholicism, Caodaism, Ancestor worship. Communism is the state ideology. It's as flat as a pancake! 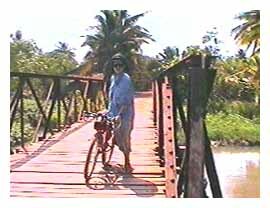 Ride 2: Around the Mekong Delta! The Ride: A very easy, 300km, four day ride (not including rest days). Dead flat country, friendly locals and not a lot of traffic. 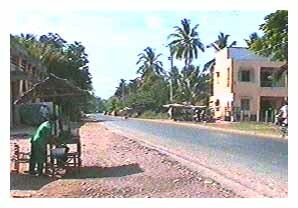 Saigon - 70km - Mytho - 16km - BenTre - 60km - VinLong - 80km - LongXuyen - 60km - ChauDoc. The Road: The Mekong Delta is as flat as a pancake. The only uphill bits are the slightly rising and falling bridges over the many rivers and canals, so expect to cruise along in top gear most of the time. The main roads between the major towns are paved and in reasonable nick, but watch out for potholes. The secondary roads are generally gravel, and of varying condition. 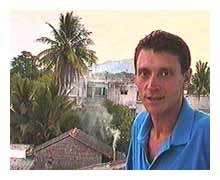 Mekong: The Mekong (Me=mother, Kong=river) flows through Cambodia, into Vietnam and empties into the South China Sea. There are five major arms of the Mekong in the Delta and you cross these mighty stretches of water by ferry which run frequently. Traffic: Light to moderate. Heaviest on Hwy1 between Saigon and MyTho, but thinning out considerably by the time you reach ChauDoc on the Cambodian border. Non-biking people go on about the traffic, but as usual, it always looks and feels worse hurtling along in a crowded mini-bus. Once out on the road on your bike there are leisurely times of silence with only a cow to avoid. The Bike: If you stick to the main arteries, you could do this ride on a light racer. However, you'd be sure to hit a pothole or two so a touring bike may be best. If you take to the back ways, as I did, you'll encounter dirt roads where a mountain bike is the best option. Just past BenTre, after three wrong turns, I hit twenty kilometres of rocky road works, which shook the living daylights out of the bike and me. As usual, I'm happy to take a mountain bike and sacrifice speed for versatility in unpredictable Asia. 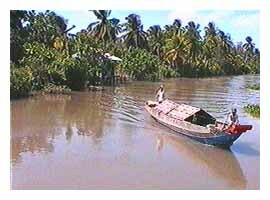 General: The Mekong Delta is a very fertile stretch of land that serves as the 'rice bowl' of Vietnam. 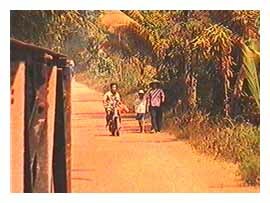 During the American War, it was largely under Viet Cong control and most of it was no-go for Western cyclists, especially at night. 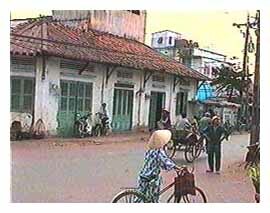 These days that's all changed and I found it quite relaxed compared to the rest of southern Vietnam. Take some time to explore the little towns and waterways along the way, where there's no other tourists and the locals are surprised. 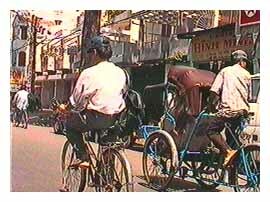 Town to town: The busiest stretch, and the most unpleasant is the 70km ride down HWY1 from Saigon to MyTho. 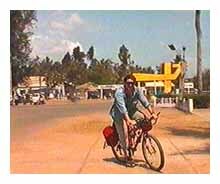 However, I get a buzz riding out of big cities, in this case through Cholon (Saigon's Chinese Quarter on the southern outskirts of the city) and further on as the countryside slowly unfolds. Down the highway there's the perennial good food and company. MyTho gets a relatively bad rap in the Lonely Planet guide, but I found it to be a fascinating, if dilapidated town. It sits on the banks of the Mekong and as Saigon was once called the Paris of the East, MyTho was likened to the South of France. A small boat trip out into the maze of old French canals is recommended. 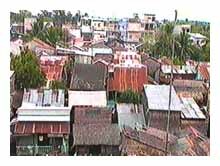 Besides MyTho, the main towns are a little boring. 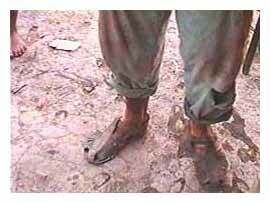 Do Viet Cong still lurk in the Delta? Just south of BenTre, Mr Pumpy was slogging along a lonely dirt track on the way to VinhLong. Suddenly, from far out in the paddies, he heard: "F**k you, G.I.!" Mr Pumpy sped off at top speed! The horror! The horror! No doubt there was some Vietnamese comedian/paddy farmer rolling around in the dirt holding his sides, but hey! Mr Pumpy has a 'cycle first, ask questions later' attitude to things. 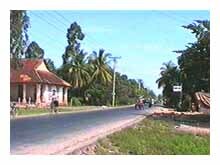 BenTre, VinLong and LongXuyen are small regional towns with no standout attractions. The main road is good but the best part of this trip was heading off the main arteries and getting lost along some of the dirt back ways (take your Flash Card! - see below). A wonderful feeling of isolation and adventure. 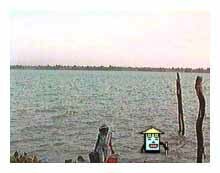 ChauDoc sits on the Cambodian border and is nothing special. Nearby Sam Mountain is another ghastly Asian Disneyland of pagodas, temples and local Chinese day trippers. Worth a ride around if only for the fear and loathing. Places to stay: Hotels at all the major towns. Most will set you back US$10 and expect to spend about US$20/day (1USD =15,000 DONG). Apart from that, it's possible to stay with friendly farmers. I got quite few offers. The Locals: Almost always friendly, apart from one minor incident which put the wind up Mr Pumpy for a day or two (see 'Viet Cong' at left). Food, drink & transport: Heaps of food, drink and local transport throughout the Delta. No need to take any supplies. Bike shops: Lots of bike shops. Cheap and reliable.